Several years ago we hosted a ceremony in our garden for the Renewal of Marriage Vows by our dear friends, Gina and John. They gave us a pot of calla lilies as a thank you, and my Arranger and I remember them and their day when the calla lilies bloom. The lilies have spread and given us some beautiful flowers to include in this Monday’s Vase. I love this color pink; I am going to have to find more of these lilies for our garden. Sometimes I think our garden is being ransacked by rabbits and deer. The damage is daily, visible, and widespread. My Arranger suggested that we add the blue and white rabbit to the arrangement as a token of its presence in the garden this week. At least this one is not predatory. Please visit Cathy at Rambling in the Garden to see what beautiful things she and so many others who are following her meme are including in their vases this Monday. This entry was posted in Gardening, In a Vase on Monday and tagged calla lilies, Calla lily, deer, Marriage Vows, rabbits. Bookmark the permalink. 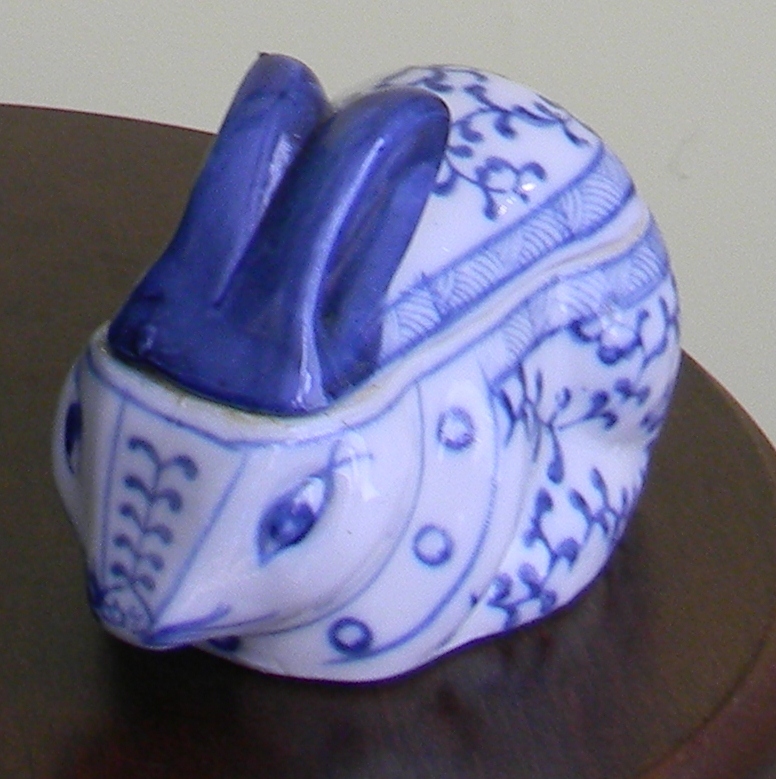 The porcelain rabbit is the best kind to have. 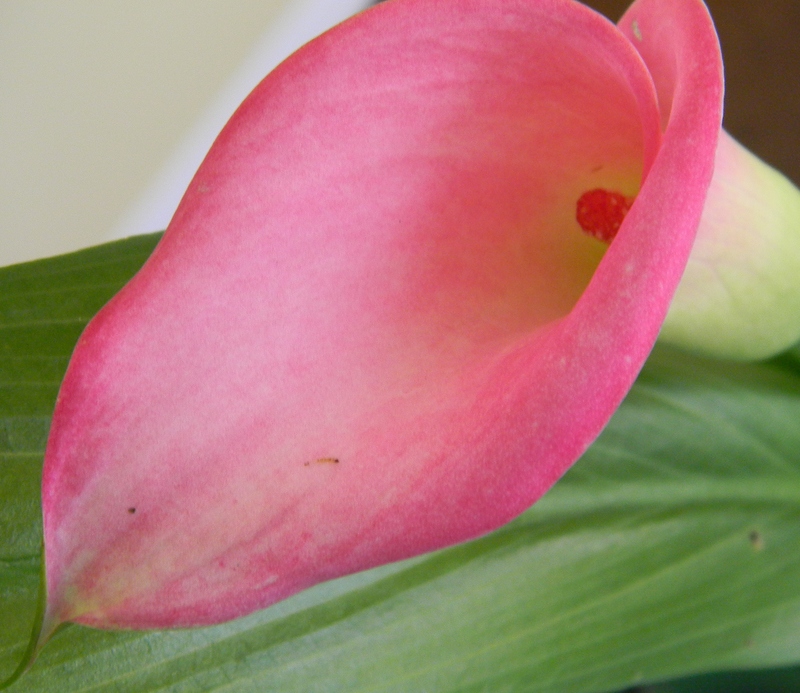 Your callas are a lovely shade of pink. I would like to try growing them. Eating breakfast this morning on the porch, I watch a small rabbit feasting on a coneflower. Woe, woe, woe! Callas are quite easy to grow. Stick them in the ground and they seem to well with no help from me. Thanks, Bec. We’re trying to live with the rabbits as best we can. It’s not fun. 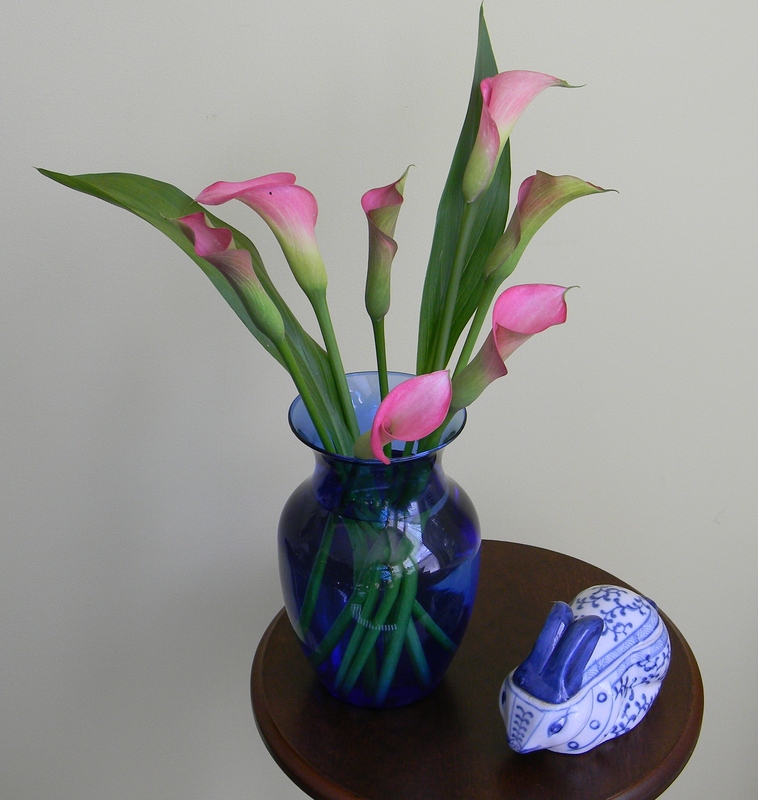 I have long admired calla lilies but do not have much luck with them even as an annual. My neighbor loves them and overwinters bulbs so he can grow them in pots….how he would love to see them growing every year in his garden….my rabbits are doing well eating the clover I let grow in my back gardens which they frequent. They seem to prefer it to any other plants which is lucky for them….living in such a wild area we had to come up with some ideas to thwart them…..apparently the Amish plant clover to draw the rabbits away from flowers and veggie beds. My rabbits don’t eat clover or weeds. Right now they are attacking the phlox and liriope. Why don’t they eat weeds? A very elegant flower John. And I do like your rabbit! Thanks, Cathy. I wish the rabbits were as easy to put away. Thank you, Cathy. Your idea is helping us appreciate our garden more fully. Thanks. They are such beautiful flowers that it’s hard to display them poorly. As the callas were a gift (in a pot), I don’t know the name. I just put them in the ground to see and they have survived at least three winters. Your callas are so beautiful, what a lovely color. They are such a great, long-lasting cut-flower. I own a similar vase! Blue compliments all colors, doesn’t it? Thanks you, Eliza. We have several blue vases of differing sizes. Love them all. Beautiful lilies and I like the combo with the blue vase. Cute rabbit. I have some rabbit statues too, the best kind to have. No fur or chewing parts! Thanks. The rabbits are creating havoc right now with the coneflowers and phlox. The battle continues. i have never seen Arum lilies in this lovely shade of pink. Very pretty. Thanks, Dorris. I am partial to this color. There’s something about Calla lilies that seems very mysterious to me, but I can’t explain it. Yours are beautiful. Thank you, Jason. I’m going to try some more. I think we are right on the edge of their winter hardiness zone.